The Fancy pigeon Saxon Monk – also known by the names: Moine de Saxe, Sächsische Mönchtaube, Monaco in Sassonia, Саксонский монах – is a variety which originated in Germany, which was specifically developed in the region of Saxony (iperkirakan around the 19th century or a little early), and includes one of the “Saxon Luxury Pigeons”. Varetas classified into type color pigeons, is also very popular in Germany, in most of the European countries, and dl outside Europe. 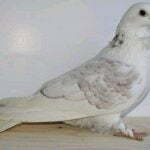 As a dove that is focused on the show, this variety is considered as one of the most classy.